It sucked and I'm in no way excited to blog about it. I can't use a single thing from this box. Acne stuff for someone with no acne, styling products to use with heating tools for someone who doesn't style or use any hair tools and some loose powder foundation. I don't have a proper brush for this product and I hate the messiness so I won't use this either. The box itself was cute and I'll use it to gift. My picture maybe makes it worse than it is because it's a crappy pic I took rather than a professional pic like the two other boxes. NYX loose pearl eyeshadow (full size) in a very wearable shimmery beigey colour that suits my style. Mai Couture highlighter paper (25 sheets, half of full size) This is not the skimp 2 sheets of blush we got in Glymm, it's a really very generous sample! I loved the way the blush looked on my face so I have high hopes, I feel they have quality products even if it's not the type of thing I'd be interested in buying because of the price. Urban Decay 24/7 glide on eye pencil (2/3 of full size) I tried this and it's really buttery and nice to use. I had only tried cheap eye pencils and marker ones and this is better than both I think. Much more natural than marker ones and so much better to apply than cheap ones. Be a Bombshell lip gloss in a bright but very pretty red. It doesn't smell great but that doesn't last and it feels good on the lips so I love it! It's a colour that is pretty much the brightest that I would wear out and about so a great addition to my collection. I don't know if this is full size? Mirabelle primer for face and eyes (full size) Nice to have! I have close to no experience with primers so this feels pretty much like my Avon one does. I would've liked a primer exclusively for eyes but it's still cool. I got this box with my "Jules" (rewards program) because I liked the green one (Cindy) a lot. This is the only one I tried from my box and it's a really gorgeous, festive, glittery green. 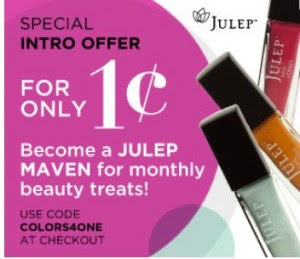 I enjoy Julep a lot. I want to try the foot scrub soon! 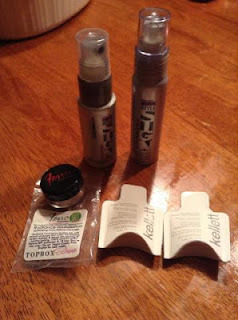 IPSY is awesome! I'd really love to get that one! Haha, I wrote the same thing about Glymm in my post :) Definitely underwhelming Topbox this month. But another hit for Ipsy!